A whole new direction for OMC. 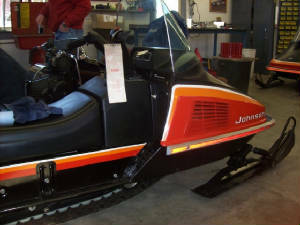 1974 saw a big change in the design of OMC snowmobiles. 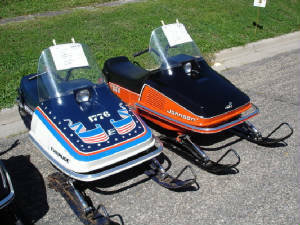 In 1974 Johnson released the JX series of sleds and Evinrude released the sister line of Skimmers. Both lines of sleds were offered in 400cc, 440cc and 650cc sizes, all fan cooled twin cylinders. 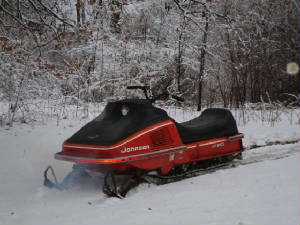 Along with the new series of sleds, Johnson changed its colors switching from the light green of the older sleds to a striking new orange and black color scheme. Evinrude stayed with its classic white and blue colors though. The author's 1975 Johnson JX650 happily sitting in the snow for the first time in 24 years. I was given this sled by an acquaintance in 2000. It had been sitting in a barn unused since 1983. In 2006 I finally got her up an running again. This sled is an absolute blast and I hope to fully restore it some day. The Manke brother's herd of beautiful JX and SR sleds. starting at the bottom and going counter clockwise we have a 74 JX650, a 75 JX650, a 76JX or SR, a Rampage, a 76 SR, a 75 JX and another 74 JX. These two sleds are owned by Kent (JX Nut). 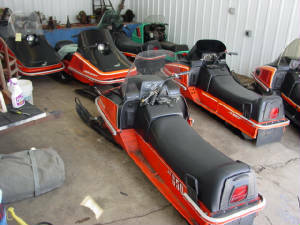 They are a very nice 1976 Evinrude Skimmer and a MINT 1974 JX650. The Manke's 0 mile never ridden 76 SR650. A lot of people are confused about what year their JX sled is. I put together a quick reference guide that should make it easy to spot the differences between the years. If anyone has a spotters guide for the Skimmers please send it in! *The JX script on the side of the tunnel is much smaller and does not have the lean that the 74 script had. * The hood and tunnel pin stripes are now dark orange, light orange and white in decending order with all of the stripes being approximately the same width. *The only year for the JX650S model which is a slide rail suspension varient of the JX series. Only the slide rail system was only offered with the 650 engine this year. *All engines are now available with either boggie wheel or slide rail suspension. Boggie wheel sleds are still called JX's, slide rail models are called SR's. The JX650S moniker is dropped. *Pin stripes are a thin white stripe on top of a light orange and then dark orange stripe. The light orange portion on the hood is much wider. Hopefully this will help you identify which year is which in the JX lineup.